V e g a n D a d: Happy 10th Birthday, Son #1! I am slowly wrapping my head around the fact that in a few days I will have been a dad for a full decade. At the very least, I can say that we have eaten some pretty good cake over the last ten years. As you may know, I bake a special cake for each kid's birthday--whatever they choose. 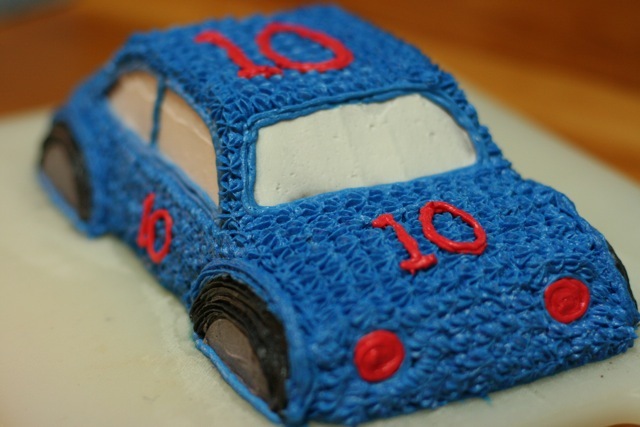 This year, Son #1 initially wanted a plain white cake with a 10 on it (going minimalist in his older years, I guess) but eventually settled on this car cake which I made for his party today (although his birthday is actually Sunday). I decided that a triple batch of Isa's chocolate cupcake recipe would fill the pan, and at first everything seemed to be going fine. But after 40 minutes of baking the centre was still goopy. After 55 mins it looked OK with a BBQ skewer coming out clean (or so I thought). But, alas! After trimming the bottom (after letting the cake cool for 10 mins), I discovered the cake was most certainly not done. I left the cut portion off, topped the cake with foil, and put it back in the oven on convection at 325 degrees. Another 10 mins and everything seemed OK. The centre was still a bit fudgy and the edges were well done, but it was passable. 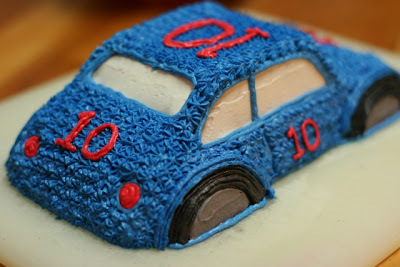 It looked even better after decorating, despite the fact that because I had to trim more off the bottom (it got pretty crusty with the re-bake) the car looked like it was sinking in a lake (the blue edge I put on did not help). The kids downed it without comment. So, Happy Birthday, kiddo!